One10. Not magic but it might as well be. "Sounded really good in my jazz big band rehearsal! Seriously, much more oomph that my previous Shuttle 1x10" cab could do. It easily kept up with a loud drummer and 20 odd trumpets, trombones and saxophones"
Do you care what's inside it? Isn't how it sounds, especially at loud volumes, what really matters? Tone - Big, warm and fat. Don't let the size deceive you. Sweet treble and smooth mids. Push it hard and it gets growly and thick. Loudness - Any jazz gig. Rehearsals or smaller gigs with typical function bands. Stack a pair to handle louder rock bands or bigger gigs. We've had a lot of bassists hear and play the prototypes in the last few months. We should have done some blindfold tests because the reactions have been fantastic - shock at how BIG something so SMALL can sound. Even more shock at how light it can be. Full-range 10" driver with 2" concentric midrange dome = TONE! Very high volume displacement = can move as much air as a good 15"
We've put everything we've learnt in the past decade into this ultra-minimalist cab. It's loud because it's clever. It's affordable because it's clever. It's manufactured in the UK, from top quality components, with very precise quality control. Before I talk about the geeky stuff I just need to say something important. I (Alex) am a bassist. Alex Bass as I have often been known. My main drive as a bassist has always been writing and arranging and recording and performing new material. I want gear that I just plug into and it works, it doesn't hold me back and it lets me get on with making music. That's what I want from every product we build - to let all our customers get on with playing music and stop having to think about gear. 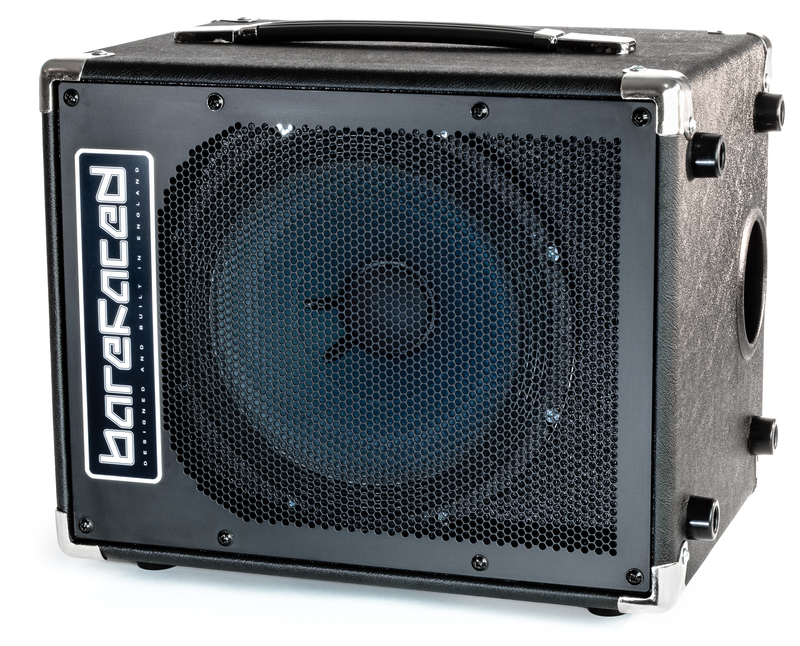 A bass cab that lets you do YOUR thing. It might bring its own vibe but it still lets YOU be YOU. I've had a lot of fun playing through the One10. Treat it kind and it's sweet and fat and honest. Treat it rough and it gets ANGRY. And everyone always assumes I'm playing through something bigger. Which is nice. Better than magic. Bloody good engineering. It contains a unique high output 10CR250 driver, designed by Barefaced and custom made by Eminence in the USA. The cone is very light which makes it very efficient (air is light too so light cones couple better because they're more like the air they're pushing). A lightweight cone wouldn't normally work in such a small box - look at old hi-fi speakers from the '50s and '60s - very light cones and very loud with only a handful of watts but HUGE boxes to give them decent bass. Our Hybrid Resonator enclosure solves the problem, damping the mid-bass hump and fattening the deep lows with two controlled resonances working in unison, and giving you a ton more power handling in the real bass. The concentric midrange dome extends the treble response and improves the dispersion - it doesn't sound like it has a tweeter but it has so much smooth clarity. The voice coil is pretty big (not too big because that would cost us efficiency and treble response) so it can happily handle 250W all day long. And it can really move air - it's basically like a good 15" or 2x10" in that respect. We made a chart comparing our 12XN550 to the best neo 12"s you'll find in commercial bass cabs - it backs up our claim that you'll need two of them to do what one 12XN can do. The 10CR250 matches those expensive neo 12"s for output - at a fraction of the size, weight and price.Barefaced quality, tone and output at a far more affordable price point. And if you get in early, a huge bargain! Retro10 10CR vs Generation 3 12XN models? The Generation 3 12XN cabs were designed for minimum colouration within their design bandwidth whilst the Retro10 10CR cabs were designed to have a flattering colouration for bass instruments. The side effect of this is that the 12XN driver is much more expensive to build than the 10CR driver, so a 1x10CR cab can be much more affordable than a 1x12XN cab!